Happy spring! Have you de-wormed your horse yet? PATH Intl. sponsor Equimax has coupons available for its apple-flavored dewormer. If you know your horse is one-of-a-kind and you want to win a month of SmartPak supplements, then we have a deal for you! SmartPak and PATH Intl. have started a Horse of the Month program to highlight the amazing work horses in equine-assisted activities and therapies do year-round. Please take five minutes to nominate your horse and get a chance to win $100 of SmartPak for a month. Photos are highly encouraged! PATH Intl. sponsor Bayer HealthCare Animal Health is introducing the "Your Ride With a Legend" educational program. This program gives equine enthusiasts access to useful horse health information from Bayer and performance tips from a pair of world-class competitors, the "Legend Riders." Upon sign-up for the no-cost program, members have the opportunity to win a trip to one of two premiere equine events: the 2014 National Cutting Horse Association (NCHA) Futurity in Fort Worth, TX; or the 2015 Rolex Kentucky Three-Day Event presented by Land Rover in Lexington, KY. These two VIP trips include meet-and-greets with the "Legend Riders" for the winners and their respective guests. Click here for information about "Your Ride With a Legend," including complete sweepstakes rules. The 2014 edition of the PATH Intl. Standards for Certification and Accreditation manual will be released and implemented on July 1, 2014. Any centers going through an accreditation site visit after July 1, 2014 will need to reference the 2014 manual and comply with these most recent standards. If you have questions about the accreditation process or the new manual, please log in to Community Connections and join the Standards & Accreditation group. The members of the PATH Intl. Accreditation Subcommittee along with your peers will be there to answer any questions you may have. Do you have a product equine professionals would be interested in purchasing? 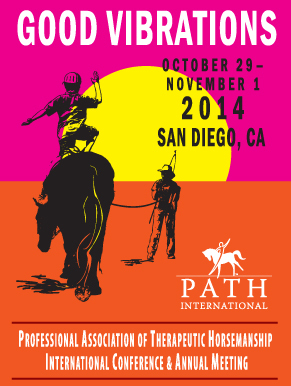 Educational materials, books, videos and jewelry are all great possibilities for selling to the 700+ therapeutic horsemanship professionals we expect to see at the 2014 PATH Intl. Conference, October 29-November 1 in San Diego. 96% of 2013 conference survey respondents said they will contact one or more exhibitors. Exhibiting pays off! Save $100 off the exhibiting fee by reserving your spot by May 15. For more information, email Megan Ferry or call her at (303) 452-1212, ext. 107. Recognize the efforts and achievements of your outstanding instructors, equine specialists in mental health and learning, equines, volunteers, veterinarians and equestrians. Nominations for awards to be announced at this year's conference are due no later than 11:59 p.m., MDT, May 20. Click here for information and for the fillable forms. PATH Intl. continues to work diligently to obtain funding sources to ensure the maximum opportunity to underwrite registration scholarships for the PATH Intl. Conference and Annual Meeting. The 2014 conference scholarship application and the 2014 Marjorie V. Kittredge Equine-Facilitated Psychotherapy and Learning Scholarship application are due by email to Karen Province no later than June 20, 2014. Everyone is encouraged to apply! Click below to download applications or find them on the 2014 PATH Intl. Conference page. A repeat presentation of the PATH Intl. Equine Welfare Committee webinar on the care and welfare of our EAAT horses will be May 12, 2014, at 11:30 a.m. Eastern Daylight Time. The webinar is free. Click here to sign up. The presenter is Cathy Languerand. Cathy is a PATH Intl. Certified Registered Instructor, a CHA Master Level Instructor, a Reach Out to Horses Certified Instructor, a USPC Instructor, Reiki Master, and is the PATH Intl. Equine Welfare Committee Chair. Don't wait to begin logging your volunteer hours for the 2015 PATH Intl. 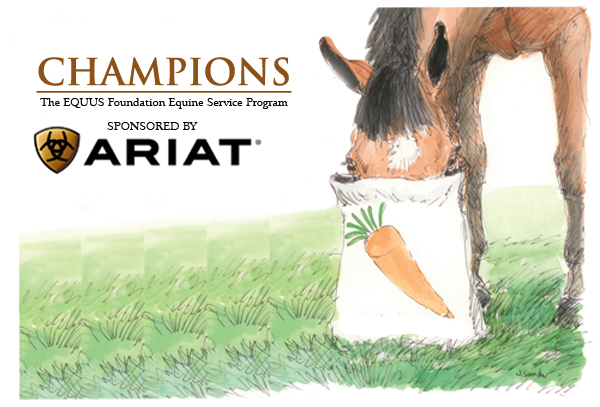 Champion of Equine Service Certification Scholarship, sponsored by the EQUUS Foundation. The scholarship financially assists prospective instructors who achieve champion status to obtain a PATH Intl. Registered Instructor Certification. The EQUUS Foundation will award one scholarship to cover the registration fee up to $1,000 for the recipient to attend a PATH Intl. Registered Instructor Certification Workshop. For more information about the champions program, the PATH Intl. Scholarship and how PATH Intl. 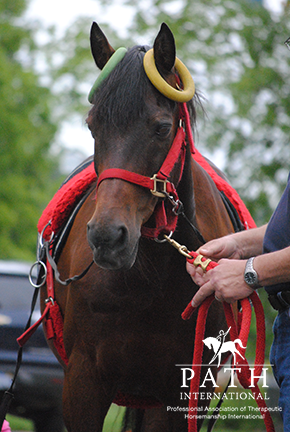 members can achieve champion status by volunteering, visit the EQUUS website. Even though the Kentucky Derby is over, we can still enjoy the link between derby contender Vinceremos and Vinceremos Therapeutic Riding Center, a PATH Intl. Premier Accredited Center in Loxahatchee, FL. Click here for the story. A proposed new "EZ" application form for tax exempt status is out for review. Implementation is expected in the summer of 2014. The current form is 25 pages, while the new form is just 2 pages. Completion time is projected to be reduced from 101 hours for the old form to just 14 hours. Organizations with less than $200,000 in revenue and $500,000 in assets will be able to use the new form. Hopefully, this will help the IRS streamline the review process, as the current average date of applications being reviewed is July, 2013. Please visit the PATH Intl. events calendar for a list of 2014 Registered On-Site Workshops and Certifications.